SharePoint is secure by default. It’s what we do it that turns it unsecure in most situations and when someone may access what they are not supposed to. 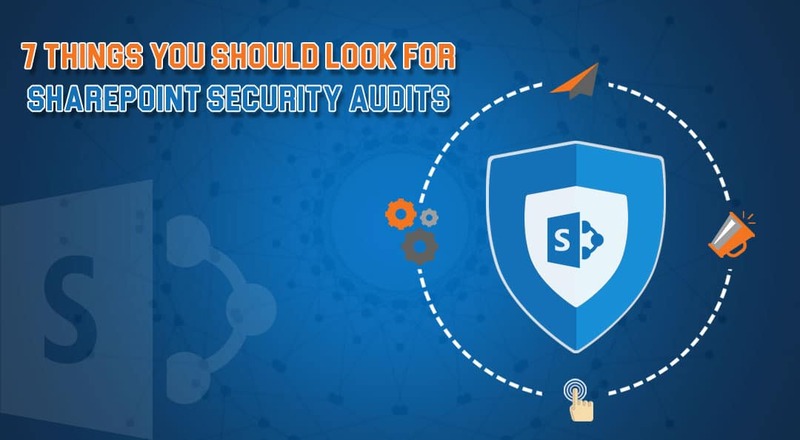 Here are seven things you should look for SharePoints Security Audits. Who viewed the documents, modified them or deleted them as well as looking at the edits to your content types and columns? We use Share Point as a platform to build what we need for our organization and then place important content within it. So it’s important to keep track and audit what’s going on it there. Checking permissions for a user or a group can be very useful, especially if you suspect a security breach or if you just want to copy permissions and verify access before. For this, You need to be able to specify a specific user/group to mange your user permission. Protect the SharePoint from any possible and unwanted external connections. Only open the ports necessary for your visitors or SharePoint services if connected with the cloud in a hybrid scenario. Not everybody in an organization should be granted the role of ‘Site Collection Administrator’. A part of a SharePoint implementation plan should be dedicated to security: which user groups of the organization are granted which permissions? Be careful with whom you grant Site Owner or Site Collection administrator roles, because it gives a lot of responsibility. For this, you need to regularly review and audit the state of play. Spot SharePoint permission changes keep your sensitive secure. Permission changes can be an indication of external or internal attackers attempting to exfiltrate sensitive data. Therefore, ongoing tracking of SharePoint permission changes is crucial to minimizing the risk of data leaks and compliance violation. IRM allows individuals to put a customized digital envelope around content. This helps prevent sensitive information from being printed, forwarded, or copied by unauthorized people. After permission for a document has been restricted by using IRM, the access and usage restrictions are enforced no matter where the document is located, because the permissions are stored in the document itself. We call this, “persistent security”. For companies with workers who use free Wi-Fi hotspot services, the stakes are high. While losing a personal social networking login may be inconvenient, people logging on to enterprise systems may be giving hackers access to an entire corporate database. For this, a customized organization should provide mobility and security awareness programs in place, it can keep users happy and your network secure. Noman Nasir Baloch is a Certified Microsoft Tecnology Specialist and plays a pivotal role in SharePoint Development of Viftech Solutions (PVT) LTD.